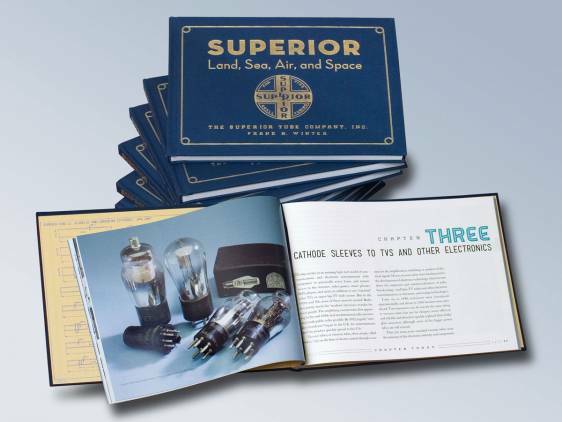 The Superior Tube Company is proud to announce the release of its first book … Superior – Land, Sea, Air, and Space … The Superior Tube Company, Inc. Superior was founded in 1934 and from its earliest days has been an important supplier of small diameter, extremely close tolerance metal tubing to industries whose products have changed our world. This richly illustrated book details the range of tubing applications that required Superior’s fine tubing beginning with radio vacuum tubes in the 1930’s. The book was published by Konecky & Konecky, LLC of Old Saybrook, CT., publishers of fine books covering all phases of history, science and art. As the title implies, technological advancements would lead to a broad array of applications for Superior’s tubing. On Land … from hypodermic needles to nuclear reactors; At Sea … from PT boat antennas to atomic submarines; In the Air … from push rods to pitot tubes; In Space … from thruster propellant lines to life support systems. Readers will also learn about operations in Trappe and Phoenixville, PA where Superior once produced special non-tubular fabrications and many photo-etched products. Generations of Superior people and their stories are also highlighted along with the early days of Little League and Lassie League baseball in Collegeville. An accompanying DVD provides an entertaining look at activities dating back to the 1930’s … including a 1935 “airplane party” showing airplanes landing on the company grounds. The book includes a timeline of significant events and a list of Superior’s fifty patents. The author of the book, Frank H. Winter, is the retired Curator of Rocketry, National Air and Space Museum. Born in London, England, and educated at the University of Maryland, Winter was on the staff of the Museum from 1970 to 2007 and has written many other books, mainly on the history of rocketry and space flight besides numerous history papers and articles. For the Superior book, he was greatly assisted by John P. Reinhart, Superior’s Manager of Product Development, and his intern, Albert “Louie” Nerino. Winter used research compiled by Reinhart, as well as historical research uncovered in The National Archives, The Library of Congress, The Free Library of Philadelphia, archives of local historical societies, as well as interviews of past and present employees. “In the past few years, one huge and critically important use of our tubing is in the exciting and dynamic field of life saving medical implants” said Anthony Jost, Superior’s former CEO and President. Superior – Land, Sea, Air, and Space is available from the Towne Book Center & Café, 220 Plaza Drive, Suite B-3, Collegeville, PA 19426. Frank H. Winter joined the National Air and Space museum in 1970 as a Historical Research Clerk, and in 1984 was named the Curator of Rocketry. He has published numerous articles, papers, and books, and has won two Robert H. Goddard Essay Awards, in addition to being presented with the first American Astronautical Society’s Goddard Memorial Lecture Medal. He is a Fellow of the British Interplanetary Society, a member of the International Academy of Astronautics, the history committees of the American Institute of Aeronautics and Astronautics and the American Astronautical Society. He retired from the Smithsonian in 2007, but continues writing and researching as a freelancer.